The Glorious Sights and Sounds of 17th-Century Rome! Behold the glorious sights and sounds of 17th-century Rome! 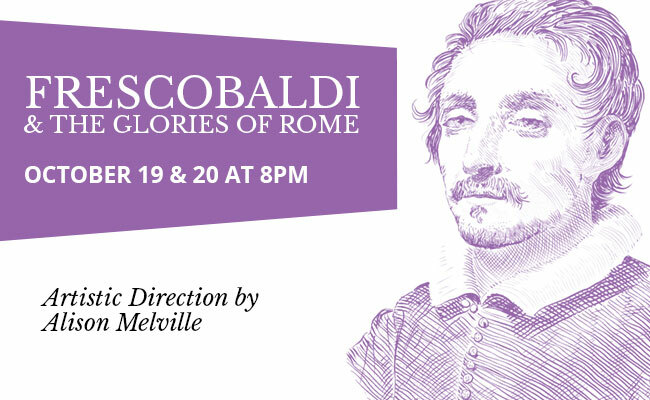 Our season kicks off in the musical world of one of Italy’s most celebrated early Baroque luminaries, Girolamo Frescobaldi. Let his music and that of Palestrina, Landi, and Caroso wash over you as images of Rome’s glittering treasures delight. This multi-media event features dazzling arias, improvisation on bass lines, and florid ornamentation of canzonas, early sonatas, and sacred works for archlute, voices, chamber organ, recorder, and hurdy-gurdy. Generously supported by Ann H. Atkinson. Join us at 7pm in Jeanne Lamon Hall at Trinity-St. Paul’s Centre for our FREE pre-concert lecture with Artistic Associate and Director of this production, Alison Melville.